EXTREMELY LIMITED SUPPLY — LIMITED TIME OFFER! with healthy fats and vitamin E.
Have you ever felt like you needed to run to the bathroom to pee every 20 minutes? For men, that can be a symptom of an enlarged prostate, not just 'small bladder syndrome'. FACT: Approximately 8 out of every 10 men eventually develop an enlarged prostate. A healthy prostate normally starts out walnut-sized but over time is likely to grow to the size of an apricot or even a lemon, especially if left unchecked. As it swells, things get, well...awkward...down there. Imagine having that desperate need to urinate and when you finally get to the bathroom...nothing happens. Imagine feeling the need to go #1 out of the blue just as things get interesting in the bedroom. Imagine what it would be like if your once walnut-sized prostate swelled to the size of a coconut? That'd be like somebody constantly stepping on your bladder 24/7. Weird...right? Of course, there's medicine you can take for that from Big Pharma. Many of those contain ingredients known as 5-alpha reductase inhibitors – the FDA now requires that these come with disclaimers warning that they can actually CAUSE prostate cancer. Taking pills from Big Pharma is like calling the fire department to put out the flames that have already consumed your house. It'll calm things down, but it would have been far better to avoid the fire in the first place. So, how can men naturally condition their bodies to prevent problems with their prostates? Surprisingly, by making Styrian Pumpkin Oil a regular part of their diet. Oil from these special pumpkin seeds has been widely tested on men. The results show that prostate enlargement may be slowed, stopped and even reversed. No negative side effects, unlike Big Pharma solutions. It's also an antioxidant powerhouse because it contains carotenoid and porphyrin phytochemicals, plus 5 times more vitamin E than even olive oil! Remember, that's 8 out of 10 men! Styrian pumpkins are grown in Eastern Europe purely for their seeds. Since they're a rare superfood, most of them get bought up fast. They're difficult to get. 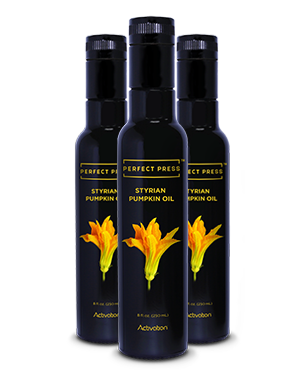 What if I told you that today you could get your hands on a bottle of Styrian pumpkin seed oil pressed from certified organic seeds? Wouldn't you like to prevent prostate issues with a delicious non-GMO solution you can easily incorporate into your daily diet? 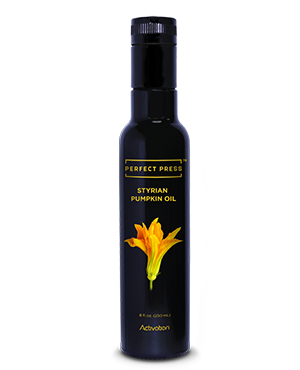 Introducing, Activation Products' Styrian Pumpkin Oil. Yes, it is a real product. And yes, it really is made the way I've just described. 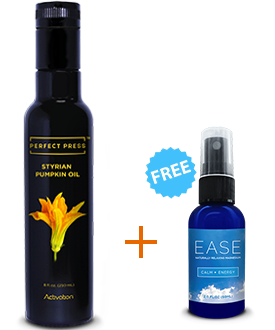 And, lucky for you, Activation Products uses an 'armored' bottle for all of its oils, unlike other suppliers. Activation puts all of their oils in Miron glass bottles, which protect the oils from UV light, which can cause rancidity. These bottles are so effective that Activation oils have a three-year shelf-life! The oil is pressed from certified organic, non-GMO seeds, raw. Just so you know, most pumpkin seed oil suppliers roast their seeds because that makes it easier to get the oil. Activation does NOT roast its seeds even though that makes it more difficult. They want you to have only the purest oil without any damage. This rare oil has previously only been available to VIP customers of Activation Products. Right now, there's just enough Styrian Pumpkin Seed Oil available to open the doors for a few hundred lucky men. If you're a man or you live with a man who doesn't want his walnut to swell into an awkward coconut... you should stock up on this oil while you can. The time to prevent enlarged prostate problems with an all-natural diet solution is now, not when it's already too late. 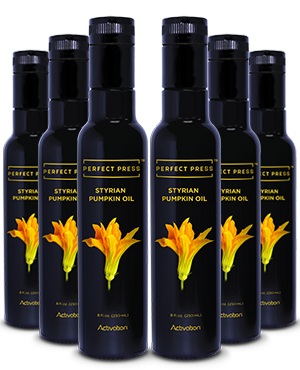 Click the button below to begin your order of Styrian Pumpkin Oil today before Activation runs out of stock again. Your order is safe, secure and you're protected by their 100% customer satisfaction money-back guarantee. No questions asked and no hard feelings.